Help-I've got no dosh! 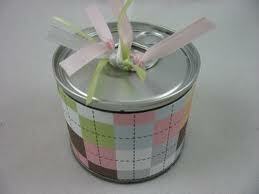 : Tin can as gifts! This soft drinks can has been recycled to make an interesting gift. The can has been washed,covered in paper and small sweets such as smarties have been inserted through the tab hole. The tab has then been carefully glued down with a glue gun and the tab decorated with ribbons to make an interesting gift. You could use other cans where the whole lid comes off to insert larger items such as little Easter eggs for an Easter present with a twist. Why not give this a go? Paper bead bracelet-mother's day gift! Make a vase from a plastic bottle! Making plastic beads from bottles! Age is no barrier to style! Regretsy-when it all goes horribly wrong!